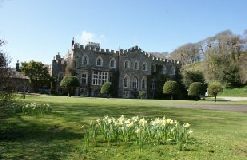 After the dreadful weather and cancellation last year – thick snow on Daffodil Day – we hope to welcome you this year in lovely spring weather! 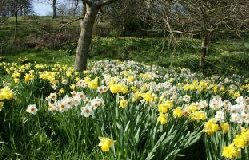 Daffodil Day is a wonderful chance to come with your family or friends to see our large collection of historic daffodils, many planted 150 years ago by our ancestors. Recently more have been transplanted from Grenville College, a former family home until 1950. Now sadly a site for development on the outskirts of Bideford, at least we have rescued some of the old varieties planted by our forebears! Our spring flower days are really good fun days out for everyone including the children and dogs. Visitors will be able to see not only the daffodils, but also lots of camellias, hellebores, early spring bulbs, mimosas and our lovely wild primroses and violets. There are plenty of really good walks including to the beach and to Blackpool Mill, which starred as ‘Barton Cottage’ in the BBC adaptation of ‘Sense and Sensibility’ and in BBC’s ‘The Night Manager’ by John Le Carre. ‘The Guernsey Literary and Potato Pie Society‘, starring Lily James and Michael Huisman, was filmed around the Abbey estate in 2017. Enjoy walking along stunning woodland paths through wild flowers to the Walled Gardens, Gazebo and the restored Woodland Summer House, hidden since 1945, with its welcoming log fire. A new circular walk has proved very popular since it opened in 2012. The Abbey itself will be open between 1 –4 pm at a small extra charge. Dogs are really welcome on leads but there will be plenty of space to let them run free as well. The Orchard, normally closed, will be open with its beautiful wild daffodils. Daffodil Day entry prices: Adults £6, Children (age 5-15) £1, Under 5 free. NB** Please note that loyalty and membership cards (eg HHA, CPRE, Gardeners World etc) are not able to be used on Special Event days.